As can be seen from the video above, Collymore scored the famous injury time winner, followed by Kevin Keegan being literally sunk in disbelief as he realised that Newcastle's title hopes had hit the rocks - after throwing away an amazingly huge 12 point lead from a few months earlier. They don't make football like that anymore! Let's hope that Friday's match is at least half as entertaining. Another point of note is that Everton have agreed to re-sign Landon Donovan on loan for approximately two months from the start of January. This clever loan deal will inevitably bolster Everton’s attack and most likely increase their number of goals scored per match. This could see Baines benefiting in the form of getting more registered assists or being involved in more attacking set pieces. At 7.7 Baines is hardly a steal, but a worthy purchase due to the aforementioned reasons. My captain for GW 19 is Robin Van Persie and vice-captain is Nani. **Due to having a spare transfer, I may also sell Joe Allen in place of Leon Osman/Landon Donovan for a -4 points hit, but this is yet to be confirmed. I should have my team posted up on the My GW Team tab (above) in the next 24-48 hours. The gameweek was full of surprises with the freakishly high prevalence of draws (7 out of 10) as many big teams failed to win against lesser teams. For instance, Chelsea could only manage a draw against Fulham as Liverpool succumbed to a poor score draw to Blackburn Rovers at Anfield. Man City failed to score in a Premier League match for the first time this season as their match against the Baggies ended goalless. Arsenal failed to exploit the draws of the teams above them as they were held to a 1-1 versus Wolves. Manchester United were true to their recent form as they won 5-0 against relegation strugglers Wigan. Spurs capitalised on the drawfest of others as they continued to hang on to the title race with a 0-2 away win against Norwich. On the mid-table front, unsurprisingly, Everton v Sunderland and Swansea v QPR ended up as 1-1 draws. Finally, Newcastle ended their winless streak by attaining victory against Bolton - as Stoke v Aston Villa ended 0-0. Well, well, well - a mixed gameweek for me - I have to say folks that I missed out on two fronts for this gameweek. Firstly my captain Van Persie failed to assist or score against Wolves at The Emirates. Secondly my third substitute Ryan Taylor got a clean sheet and assist, but unfortunately he will not be featuring as an auto-sub - thus lost points there. On a brighter note, I am confident that my overall GW score will be higher than the average as many oddball results meant that a majority of FPL gamers will have lost out more so than myself - At least I was able to manage a major "BALE OUT" - as Bale (2 goals), Walker (clean sheet), Adebayor (assist), Ben Arfa (goal) and Ba (goal) put me in good stead. On a side note, the valuable points picked up from my Spurs' players also allowed me to win against my opponent in the first FPL cup match. As for future changes to my team I am inclined to bring in Smalling to replace the injured Evans (who replaced the injured Jones only last GW!). Moreover, I may prepare myself for Spurs and Everton's double gameweek (GW 20) by bringing in the likes of Baines and Osman. All will be revealed soon. Until then, stay tuned! 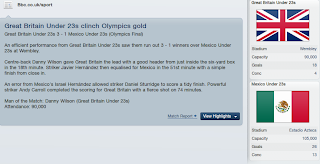 Final Score v Mexico as Team GB win Gold! Michel Vorm a.k.a "Penalty Killer"
My recommended player for gameweek 18 is finally a goalkeeping pick. He’s done surprisingly well thus far in the Premier League. It’s Swansea City’s Michel Vorm. The Dutchman has won many fans for his match saving and winning displays. He has defied the odds by keeping 8 clean sheets out of 17 matches – a remarkable feat for a newly promoted team and player that have never played in the Premier League. Such has been his impact that his FPL value has increased by 1.1 from August. At 5.1 he is still a steal of a purchase, cheaper than many top goalkeepers. He also has two penalty saves to his name – giving credence to his surprisingly apt nickname – “The Penalty Killer”. Vorm has acquired 22 points from him last three games. His points tally can be furthered even more with Swansea’s next match at home to QPR. Of course shortly after that he will face Tottenham and Arsenal – but you could always bench him for those matches, provided you have a half decent sub (I don’t!). Vorm has also been capped by his national team and it may be difficult for Swansea to keep hold of him if a big club comes knocking in June. All this begs a question, will Vorm’s second half of the season be as good as his first? My captain for GW 18 is Robin Van Persie and vice-captain is Nani. My gameweek 18 team will be updated here within the next 48 hours. *I still have one free transfer at hand as I didn't make any transfers in GW 17. Manchester City have ended up as the team on top of the Premier League before the boxing day sales with a 0-3 victory against Stoke City, as Blackburn were consigned to 20th after suffering defeat to relegation comrades Bolton. Newcastle suffered a disappointing 2-3 loss at home to West Brom - Interestingly they haven't won a single home match after St James' Park was renamed the Sports Direct Arena! Manchester United won 0-5 at Craven Cottage as Arsenal fumbled to victory at Villa Park. Liverpool could only obtain a draw against Wigan, as Tottenham and Chelsea could only manage an even scoreline against each other. Everton won at home and kept a long awaited clean sheet, as Sunderland gained three crucial away points at Loftus Road. Finally, Wolves and Norwich couldn't outscore one another as they drew 2-2. The gameweek also saw two records of note achieved as Aston Villa's Marc Albrighton scored the 20,000th Premier League goal. In addition, the legend that is Ryan Giggs continued his sensational run of scoring in every edition of the Premier League. On the face of it I have had a fairly good gameweek as my midfielders and strikers shared a respectable 5 goals / 4 assists between them. However, apart from Enrique (who kept a clean sheet), my defence let me down as Richards was subbed off on the 59th minute (robbing me of his clean sheet points!) and Jones hobbled off injured (again lost clean sheet points). As a result of Jones' injury I have decided to sell him with a cheaper United defender to release funds and avoid the risk of losing a player long-term on the sidelines. I am toying with the idea of also signing a Mata or Silva type midfielder but may not do so yet. I will keep faith with Hatem Ben Arfa for the Bolton match in the hope that he will build on his assist and also start the match. Aside from the above stay tuned for my recommended player for gameweek 18 article which I will post shortly. Ciao! I came across the following recently and thought it may bring about some nostalgic memories among a section of my readership. For those of a certain age you may remember The Hurricanes cartoon from the mid-1990s (see above). It was about a football club (or "soccer club" as they would call it) and for some surreal reason was voiced by American voice actors. To be honest with you, I vaguely remember watching the cartoon on a few occasions (I think they also launched a computer game). However the cartoon was so obscure that I can't name any of the main characters. The cartoon's launch coincided with the rise of the English Premier League and also overlapped with USA 94. Was it a clever ploy to capitalise on the rising popularity of football/soccer in the 1990s? or a random coincidence? You decide. Either way the cartoon was phased out very quickly and nothing of the football-cartoon-sort has really come about since. When will a player's price increase or decrease in FPL? The answer is: We don't know for sure when. FPL have their own hidden formula, most likely based (among other things) on the actual demand for a player. This may then be further calculated via net transfers with set quotas to be met from FPL gamers' transfers to ultimately determine if a player's price will rise or fall. For instance, if a Premier League footballer has had a really good gameweek his price is likely to rise due to subsequent demand via purchases. Where as a popularly selected Premier League player suffering from bad form (or a long-term injury) will eventually be transferred out, have decreased demand and almost certainly see his price fall in the immediate short-term. According to some, price increases/decreases are capped at 0.3 per gameweek. Courtesy of my friends at FPL Dugout, I was referred to the following website (FISO Crack the Code) which can provide estimated projections* of player price increases and decreases. *Disclaimer: They are not 100% correct and their projections should only be used as a guideline. The benefit of knowing of price changes is crucial as it will ultimately affect your team value and your spending power. Thus you will benefit if a player from your FPL team increases in value. But you may also be short changed if a player from your FPL team decreases in value. This isn't to say that a player with a declining price will not bounce back or a player rising in price will not go through a bad patch in the future. As with all FPL decisions it's all about calculated probability, some luck, a bit of skill on your part and some hunches, etc. Do bare the above in mind when making FPL transfers in the future. "He's been brilliant for us"
After endorsing a risky pick in gameweek 16, I am going for a tried and tested option for this gameweek. Thus my recommended player for gameweek 17 is a player that I already have in my team, it's Newcastle United's Demba Ba. Ok, so he didn't score last week - but he was very unlucky against a dogged Swansea team after hitting the post and having other good chances denied by their surprisingly strong defence. Demba Ba has been the source of many important United goals during this season. He had a slow start (in part due to religious obligations) by not scoring in the first five gameweeks. But he has proved his worth in a shoe-string budget Newcastle United team with 11 league goals in his last 11 league games, as well as contributing three assists. At 7.3 he is a steal - his price increased by a rapid 0.3 in the last gameweek after being signed up by a remarkable 100,000+ FPL gamers in the space of 7 days. His price is bound to increase even more especially with West Brom at (home) and Bolton (away) - he is Newcastle United's sole goal threat. But be warned. He will be absent from the Premier League for over a month as he is due to participate in the African Cup of Nations, after playing Manchester United on 4th January - so make sure you sell him after that match. I have decided to make no transfers for this gameweek. 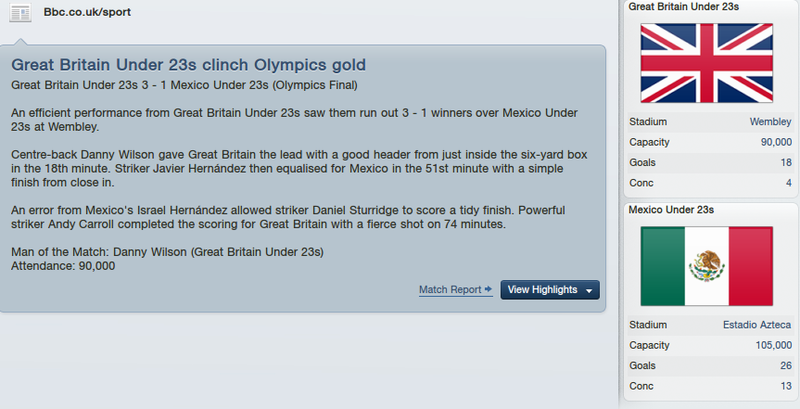 This is due to my strong bench and intention to obtain an extra free transfer. My captain will be Demba Ba and my vice captain will be Robin Van Persie. My gameweek team will be updated here in the next 24-48 hours. Comments most welcome as always. Man City bounced back from their defeat to Chelsea, by defeating a resurgent Arsenal 1-0 at the Etihad (and keeping a much sought after clean sheet). Man United and Liverpool also kept clean sheets, albeit away from home, with 2-0 wins respectively. Tottenham beat Sunderland 1-0 at White Hart Lane as Swansea held Newcastle United to a damp squib 0-0 draw. West Brom increased the pressure on Steve Kean to be sacked, as they defeated Blackburn Rovers 1-2. Fulham won 2-0 at Craven Cottage versus Bolton as Stoke found victory away from home. Finally, Everton were held to a 1-1 draw at home to Norwich; as were Chelsea (surprisingly) away to Wigan. Ok folks, so I messed up with my recommended player for GW 16. He didn't play a single minute of the aforementioned 0-0! But in some ways I am glad he didn't start or do a second half cameo, due to the number of points I got from my bench. Walker and Enrique got me points from keeping defensive clean sheets, as did Joe Allen from midfield (15 points attained from them: pre-bonus points update!). The other two players from my first team that didn't play were Ryan Taylor (Newcastle United) and Gareth Bale (Tottenham Hotspurs), due to last minute injuries. Interestingly, my goalkeeper and defenders all kept clean sheets, where as my midfielders and forwards scored/assisted 0 goals. With all the above in mind, I have had a mixed gameweek. It could have been a disaster with lost points on the bench or no points from the bench - but I was fortunate in having a strong bench. I urge you all to beef up your subs' benches if you haven't already done so, as you could lose points due to squad rotation or injury - primarily due to the end of December/start of January fixture jam! 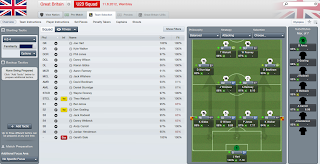 Despite Ben Arfa not playing I will still keep him in my team for WBA at (home) and Bolton (away). My trust with him for the next two GWs is primarily due to the fact that I think Pardew needs Ben Arfa's attacking creativity and is bound to use him, subject to common sense prevailing. I am tempted to do no transfers this GW (a rare non-move on my part), in-order to have an extra free transfer at hand. However, I am keeping a track of David Silva, trying to find a replacement for Ryan Taylor and possibly ditching Joe Allen. I will upload my recommended player for GW 17 shortly! Until then, adios. "was one of the best-rated talents in France"
Calculated Probability + Hunch + Player/Managerial Skill + Luck = Potential Success! It should be noted that Swansea haven't won a single away game in the league this season. Where as 15th place West Brom have been generally inconsistent and have conceded more than a goal per game whilst playing away. As for Bolton, they have only won 1 home league game out of 7 thus far and conceded goals at an abysmal rate of 2.6 at the Reebok Stadium. These figures alone are a no-brainer and indicate that you should have attack-orientated Newcastle United players in your team (for the time being). My hunch is that Pardew will try and reiniviograte his attack, to compensate for losing his first choice defensive core (of S Taylor and Coloccini) to injury. Pardew will be fully aware of the fixtures ahead. Don't be surprised if he will ditch the conservative attack mindset of having the Ba/Best combo or having Ba as a loneish striker up front. I accept that Ben Arfa didn't play a single minute of the last league match - but it really is his time to shine. He has spent the past few gameweeks attaining crucial match fitness and his attacking abilities are such that he can play on the wing or in an attacking midfield position. Even if you are not keen in having him in your first team, he is a talented player and a cheaply priced bench warmer (5.4) - especially with the busy end-of-december fixtures appearing on the horizon. His player skill is too good to ignore. I wouldn't be surprised if he starts in all of the next three GW matches, or if he makes credible super sub appearances in at least 2 of the next 3 matches. My "manager skill" dictates that now is a good time to buy him due to the aforementioned. If he flops after the three upcoming GW fixtures it's no big deal as probability has made him a short-term favourable first team pick (or bench warmer) and you can always replace him. Of course, having said all of the above, you will need to hope for a bit of luck if you do end up picking him in your team. Here's to hoping for some potential success with Hatem Ben Arfa! *I reserve the right to change my team prior to the start of the GW and will denote any team changes on the Blog's FB page. Man City's percieved footballing logic of "it's not how many goals you concede; it's how many you score!" finally failed, as the league leaders unbeaten Premiership run came to a dramatic halt at Stamford Bridge (2-1: sensationally downed by a Frank Lampard penalty). They will rue their missed chances versus Chelsea during early spells of dominance, prior to getting a man sent off. City will now have to pick up the pieces and especially look at their leaky defence which has kept a paltry 4 clean sheets out of 15 league matches thus far (with the last one on 1st October). In other matches, Champions Leage chasers Arsenal and Liverpool won 1-0 a piece at home, while conversley lowly placed Bolton and West Brom both lost 1-2 at home. Man Utd at last found form in front of goal by scoring four past Wolves at home, as did Norwich against injury-hit Newcastle United. Swansea won with a clean sheet against Fulham and Martin O'Neill marked his managerial debut for Sunderland with a last gasp win over Blackburn. Finally, surprise title contenders Spurs suffered a mildish shock defeat away to Stoke (1-2). As for my GW team it did fairly well, by scoring a very decent total of 79 points - my highest gameweek score thus far for the season. But it could have been so much better... Had I captained my recommended player for Gameweek 15 I could have scored an astounding 90 points! Nevertheless, taking the actual captain's points into account - four of my players hit double digits - Nani (18), Vorm (12), Ba (12), Van Persie (14* as captain). The 56 points between the four players in question were courtesey of a penalty save and five goals. I have no real individual player dissapointments with my GW team, apart from Aaron Ramsey. He should have had far more goal and assists over the last few gameweeks, had it not been for his abundance of squandered chances. In truth he is not attacking enough from my perspective (too centralish of a midfielder). To top things off his value has dropped. Thus I was scouting for a replacement from Liverpool, Newcastle United and Manchester United (who I believe have favourable upcoming fixtures). Remarkably - not only have I finally decided to sell Ramsey - but replaced him with a cheaper, attacking and bolder pick that I will reveal in my recommended player for gameweek 16. Until then stay tuned! "Nani's got the potential to do what he wants"
Provided that he plays regularly and does well during this period his value could easily rise from 9.9 to a high of 10.5+. The chances are that he will play regularly during this period, as United are behind City in the league and are currently without two other midfielders - Cleverley and Anderson. I was contemplating replacing Ramsey for Nani, yet instead I got rid of my cheap stock filler midfielder Ferguson (4.1) so as to ensure that I have a sound bench for the busy end-of-December period. Despite Nani's mediocre season by standards from last season, he is still remarkably listed as the fourth highest midfielder for overall points thus far. At 9.9 he is a sub-10.0 proven midfielder that could bring you some seasonal cheer. My team for GW15 can be found here. During a bog standard gameweek 65 points* (*61 after the extra transfer) would be considered fairly decent-ish. This is what I accumulated for GW 14, but a breakdown of the statistics tells a different picture altogether, which I shall divulge in later during this post. But to sum up the results, Newcastle lost their unbeaten home record with an unlucky 0-3 defeat to Chelsea, as Blackburn attained a much needed victory over Swansea (4-2). League leaders Man City won 5-1 at home, whilst QPR drew 1-1 with their fellow promoted comrades Norwich. Tottenham won 3-0 at home against Bolton and neighbours Arsenal won 0-4 away versus Wigan. Man United and Stoke both registered 0-1 away wins, as Wolves won 2-1 and Liverpool lost 0-1 to Fulham. Now back to the stats - I had Bale (11 points), Jones (15 points) and Van Persie (15 points) in my first team, yet despite this I unfortunately captained Adebayor who only acquired two points. This proves all the more frustrating as Tottenham were playing a 10-man Bolton team for most of the match and Adebayor had plenty of chances to score. Interestingly none of this week's top three points scoring Goalkeepers, Defenders, Midfielders or Strikers had a value of 10.0+, apart from Mr Consistent - Robin Van Persie. This could be an indication that buying the most expensive player doesn't always equate to mega points during a gamweek. In fact, a lot of sub-6.0 valued players shined - i.e. Schwarzer (4.9), Hennessey (4.5), Huth (5.6), Vukcevic (5.7), Yakubu (5.6) and Fletcher (5.7). In spite of this, I will not indulge in panic buying of any of these cheaply priced players, based on this gameweek. Looking to the future, Man United, Newcastle United and Liverpool have a fairly decent run of fixtures until the end of the calenday year - It is advisable to have players from these teams during this time. It is also important to beef up the subs' bench with the onset of busy end-of-December fixture schedule and usual bad weather which may lead to match postponements. I have made my one transfer for the gameweek, which I shall reveal as my recommended player for gameweek 15. Until then, goodbye. Another gameweek, another footballing death. I have just heard the news that the former Brazilian footballer Sócrates has died at the age of 57. He played 60 times for Brazil scoring 22 goals. His goals were often spectacular as was the case in the 1982 World Cup with Brazil - that team was probably the greatest team never to win the World Cup, as is evident from the video above. He mostly played football in Brazil apart from a stint in Italy and one-off spectacular return to football with Garforth Town in 2004. Not only did he go to university, he qualified as a doctor, an absolute rarity in the world of football. Sócrates will be known for his on-field talent and off-field persona that made him one of the most iconic players of his generation and a great artist to the beautiful game. Courtesy of BBC Sport, we have the Euro 2012 Groups for you, as displayed above. So Group A seems easy, with any four of the teams capable of progressing to the knock out stages. Group B seems tough, with Netherlands, Germany and Portgual promising much competition. Group C seems hard on Ireland with the reigning and former world champions (Spain and Italy) giving them company. Group D is mildy difficult for England as they face co-hosts Ukraine, former European Champions France and their bogey team (who they finally defeated after 38 years) Sweden. "Everyone is scared of him"
My recommended player for gameweek 14 is an obvious choice and should have been in my GW team for the last few weeks - it is Tottenham's Gareth Bale. It is not too late to reap rewards from him as Spurs have relatively reasonable fixtures up until mid-January. By endorsing Bale, I have now recommended three Tottenham players in the space of a few gameweeks, which indicates their on-field fortunes, as well as their upcoming potential successes. In theory Gareth Bale sounds like the kind of player that should be nailed down to your team from GW1. However, last year he didn't consecutively get a goal or an assist in the Premier League, despite scoring seven times and surprisingly only assisting on three occasions - many of his consistent successes of 2010/2011 were in the Champions League (as is evident in the above video). Many GPL gamers didn't pick Bale at the start of this season due to Spurs's slow start. That's changed now. Bale has had a goal or an assist in each Premier League match since GW10 which has seen his value rocket from 7.9 to 8.6. Thus far he has scored four and assisted four. As a consequence of this Tottenham are now hot on the heels of City and United. His current value is still very reasonable and warrants selection as he is far cheaper than the likes of Nani, Lampard of Silva. Like Adebayor, buy him now before his value smashes the 9.0 mark! My captain for GW 14 will be Bale's teammate Emmaneul Adebayor. My complete GW 14 team can be found here. The gameweek had a sombre ending with the tragic death of Gary Speed. The Premier League kicked off with Stoke recording a home win against relegation strugglers Blackburn. A deflated Chelsea comfortably defeated Wolves 3-0. 10-man Newcastle United (one of Speed's old clubs) defied the odds and remarkably (or controversially) held out for a 1-1 draw at Old Trafford. Norwich won 2-1 at home, whilst Sunderland lost 1-2 at home. Tottenham won 3-1 versus West Brom. Arsenal's free-scoring Van Persie finally failed to net a goal after five consecutive weeks of scoring. Swansea valiantly held out for a goalless draw at home, as Manchester City failed to win for only a second time in the league this season with a 1-1 draw at Anfield. Swansea' Vorm (4.6) has continued to show his value for money by keeping a more than respectable 6 clean sheets out of 13 thus far. Unfortunately, I lost out on points by making RVP my captain at a time when with hindsight it should have been Adebayor. On top of this, I lost points on VDV and Phil Jones not playing. The much maligned John Terry (7.4) scored his fourth goal of the season and makes him a favourable name for potential selection. Due to Rooney's failure to score for another gameweek, I may now replace him with Demba Ba or another goalscoring alternative. Moreover, I am inclined to replace Ramsey with a more attacking midfielder. On a side note, my two purchases of Adebayor and Walters did me proud by getting two goals and assists between them. I shall upload my recommended player for gameweek 14 in due course. Once again - I pass on my sympathies to Gary Speed's family and all football fans that have had an affinity with him. It may come as a shock to you, but Gary Speed has died at the age of 42. He was the manager of Wales and had dramatically changed their on-pitch form of late for the better. He leaves behind a national team with young star potential - who knows to what heights he could have taken them. In his playing days he operated as an effective central midfielder that could score and create crucial goals. To state the obvious - he would have slotted into any Fantasy Premier League team of the past two decades. During his international playing career his contemporaries included fellow legends such as Mark Hughes, Ian Rush and Ryan Giggs. He represented his country on 85 occasions. I personally remember Gary Speed from his playing days as an important club player at Newcastle United, where he helped us reach the 1998 and 1999 FA Cup finals, as well as getting us into the Champions League. The evergreen midfielder had won a league title earlier in his career with Leeds United and was remarkably playing a high quality of football into his late 30s. At one point he even held the record for most Premier League appearances. We will never know how successful a manager he could have been. Gary Speed - A manager and man of so much talent that died so young. My sympathies go to his family and to the people of Wales. Goal line technology in the Premier League? Is it time to introduce goal line technology in the Premier League? Football is a modern day sports leader courtesy of it being a successful billion pound global industry. Yet when it comes to technology and officiating key decisions it is still stuck in the nineteenth century. Less lucrative sports such as cricket have invested time and money in technology for sporting decisions. This has led to more just and accurate on-field outcomes in the world of cricket. Why hasn't top-flight football learnt from cricket? If the same could be applied to football it can help resolve goal-related disputes in a matter of seconds. Such controversy on the lack of technology is often continued beyond the match and in my estimation tarnishes the reputation of the game. I could unnecessarily advocate technology to be used on a whole host of matters on the pitch (i.e. penalties, offsides, etc.) but I think its high time that we have it to clarify goal line incidents. I accept that England v Germany (World Cup 1966) or England v Germany (World Cup 2010) could have had different outcomes with goal-line technology. However fairness would have prevailed in a sport that in theory champions discipline and sportsmanship. It's good to hear that trials are currently taking place to ascertain the best equipment for future usage. But this should have happened twenty or so years ago with the advent of the Premier League. It's time for football to come out of the Victorian era and truly enter the new millennium by embracing goal-line technology. The question remains - will FIFA, UEFA or the FA embrace it wholeheartedly or undermine its importance for another twenty or so years? This is a new feature that I have added to my blog courtesy of PhysioRoom, which will be available on a regular basis from here. Please note that it is to be used as a guide, rather than a 100% accurate portrayal of injuries, as managers may sometimes rest fit players and even play part-injured players, etc. PhysioRoom.com, suppliers for Sorbothane, tennis elbow brace & wrist support. My recommended play for gameweek 13 is Tottenham's loan signing Emmanuel Adebayor. He brings proven pedigree to Spurs' lack of striking options, courtesey of his experience with the likes of Monaco, Arsenal, Real Madrid and Man City. Such has been his impact that he has been a regular starter, which has led to England's Jermain Defoe being relegated to bench duty. 5 goals and 5 assists from 9 matches indicates that he is involved with goals on a regular basis. Admittedly he had not scored for 6 gameweeks prior to GW 12, but this should not underestimate his true worth. As mentioned when recommending Kyle Walker a few weeks ago, Spurs have relatively generous fixtures up until mid-January. This will allow for more goals for Tottenham's attack orientated team and may even make them surprise title challengers come the New Year. At 8.6 he is a relative steal when considering the prices of the out-of-form Rooney (11.9) and his team mate Hernandez (10.0). It would be a surprise for Harry Redknapp to bench Adebayor in place of Defoe, unless he and Spurs go through a bad patch. Buy him now before his value exceeds 9.0! PS - My team for GW 13 can be found here. My captain for GW 13 is Robin Van Persie! David Beckham may have got his Hollywood ending by finally winning the MLS Cup, but Newcastle United's unbeaten dream start finally came to an end in the Premier League. The Geordies almost kept a first half clean sheet prior to the flood gates opening up before half-time. Their concessions included a Micah Richards goal and assist, which bagged him a whopping 14 points. My recommended player for gameweek 11 could have got an astounding 18 points had it not been for a late goal by Gosling. My GW12 captain Dzeko didn't play, which meant I got double points for my vice captain, Van Persie (Lucky me!). He extended his double digit points scoring run to five matches with a brace at Norwich. The mis-placed Rooney continued his barren run of not scoring as United won 1-0. QPR won a five goal thriller at the Britannia, as Rovers were held to a 6 goal bonanza at the JJB. Chelsea recorded a shock loss at home to Liverpool, which dented their title hopes. Everton and West Brom recorded wins v struggling Wolves and Bolton respectively. Last but not least, Sunderland and Fulham recorded a 0-0 damp squib at the Stadium of Light. An interesting point of note is that no Premier League midfielder recorded 10+ points this game week (apart from Bale), a surprising rarity for FPL. This could be due to the fact that a lot of the usual big hitting midifielders such as Silva, VDV and Lamps didn't really do much in the goals/assists department. In total I bagged 66 points this gameweek, allowing myself to be elevated by 20,000ish positions (a sixth consecutive gameweek rise!). This has been in part to long-term projections. For instance I cited Tottenham's form and generous fixture list until mid-January as my reason to buy Kyle Walker. I have now used this as my justification of finally ditching my problem player, aka Man City's squad rotating Dzeko in place of Emmanuel Adebayor. Moreover, I have been looking to make a like-for-like price replacement in midfield. I have finally done so, by replacing Cabaye (6.0) with the more attack orientated Jonathan Walters (6.4) who has currently notched 4 goals and 2 assists. Crucially, in my opinion, Stoke seem to have relatively reasonable upcoming fixtures with: Blackburn (H), Everton (A), Tottenham (H), Wolves (A), Norwich (H), Man City (A), Aston Villa (H), Wigan (H) & Blackburn (A). If Rooney continues to misfire and Ramsey continues to only produce pointless assist assists, I may be inclined to replace them both with Silva and Ba respectively. I will post my recommended player for GW 13 shortly. In the mean time, let's hope David Beckham declines a move to a non-English European club and opts for a shock move to the Premier League... via the North East of England... under Alan Pardew's Newcastle United! The number 23 shirt will be waiting for him. I have been monitoring cheap bargains of late and have finally bought one. You may not have heard of him, but my recommended pick for gameweek 12 (and beyond) is the 21 year old Wales International Joe Allen (Swansea City). He forms a formidable midfield with Bales and Ramsey on a global level. He has started eight of Swansea's last Premier League matches, providing a credible two goals and two assists. He is listed as a midfielder, but plays behind Danny Graham in an attacking midfield role (almost second striker), or as I call it the VDV slot. I was inclined to buy Bolton's Eagles (5.4) but was unconvinced by Bolton's lack of goals. Also, by buying Joe Allen I am saving 0.7 over Eagles and a further 0.7 on the player that I swapped him for (Scott Sinclair, 6.1). I decided to make the transfer as both are first team regulars for Swansea, yet with a relatively huge 1.4 price difference, there is only a one goal difference between them. I know Swansea are playing Manchester United this gamweek and will be hard pressed for goals against the league champions. But United's defence has been leaky (bar the last two gameweeks) and Swansea have been scoring goals. Even if you don't have him in your first team it is worthwhile having him as a a cheap stock substitute. Ultimately, the reason why I bought Joe Allen is due to his star potential at a cheap price and also as it has allowed me to free up funds, which I can hopefully invest in a Silva. My captain for gameweek 12 is Edin Dzeko. My full game week team can be found here. "A situation in which two suppliers dominate the market for a commodity or service"
Seeing as there were no Premier League matches over the weekend (due to the international break), I thought it best to do some on-the-ground football research. As a consequence I popped over for a visit to the league champions (Manchester United) and league leaders (Manchester City), whilst fancifully hoping to conduct player interviews. Unfortunately, I didn't come across any famous players at either of the grounds. And then I began to "interview" myself in my head. I asked myself: Is the city of Manchester big enough for two Premier League football clubs? Will City always live in United's shadow? Are United on the decline? Should they merge to create a super club called "FC Madchester"? Should I be asking these questions to former pros of the respective clubs and not to myself? It is my belief that City and United are the two major forces of the Premier League this season. They have the stadia, players, fans and finances which justify their duopoly of Manchester and dominance of the Premier League. Their first teamers will inevitably be worthy picks for your fantasy premier league team on a regular week-by-week basis - be it Jones, Silva, Richards, Rooney, etc. They will more than likely finish 1st and 2nd come May 2012. But the questions remain... In which order will they finish? Which of their players should I pick and when? Will they buy any star players in January? What on earth is FC Madchester??? Ponder on that for now - I will post my recommended player for gameweek 12 soon. Until then, goodbye! In the week when Fergie celebrated his 25th year at Manchester United, my team enhanced its overall position for a fifth consecutive gameweek. With the bonus points update on Monday morning, my team scored a respectable 77 points. This is my highest gameweek score thus far for this season and shows signs of me building upon consistency. Firstly upon my gw changes. I ditched Hart and Petrov, in place of Vorm and Van der Vaart. The expensive Hart conceded a goal v QPR, whilst cheap as chips Vorm pulled off a remarkable clean sheet at Anfield. Petrov didn't play, where as VDV failed to score or assist after six consecutive gameweeks. But have no fear with VDV, as the vast majority of Spurs' fixtures until mid-January seem winnable, he is worth keeping in the team up until then. Micah Richards, my recommended player of GW 11, conceded a goal which depleted his weekly points tally, where as Jones and Enrique did me good by keeping clean sheets. Ryan Taylor made up for the lost points of a clean sheet by scoring a 25 yard screamer which boosted his tally. Cabaye's injury in the first half dented his chance to shine and Rooney in midfield was unconvincing and unsuccessful. Rooney has now failed to score in six consecutive gamweeks and is shortlisted for the chop. 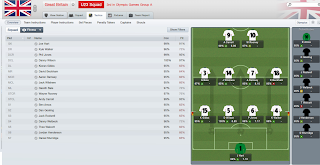 Ultimately, it was my other two strikers that led the charge. Dzeko and RVP (captain) shared two goals and two assists between them during this gameweek. These two players generated the bulk of my GW points tally. I recommended RVP in GW 9 and tipped of his potential success and price rise. This has now happened. Dzeko was my problem player who I kept faith with. He has rewarded me handsomely in the last two gameweeks. For GW 12, I am toying with the idea of obtaining Silva and Agbonlahor by replacing the injured Cabaye and out of form Rooney. I will post my recommended player of gameweek 12 shortly. As always I look forward to your comments and feedback. Demba Ba - Hot shot striker that has made the Toon forget about Andy Carroll. Yohan Cabaye - Classy central midfielder. Won the league with Lille and could fit in any top team. Cheik Tiote - Has been a defensive midfield rock in the team since last year. Sylvain Marveaux - Winging sensation that is trying to become a regular first team player. Gabriel Obertan - ex-Manchester United misfit/winger that has provided class on the flanks. Hatem Ben Arfa - recovering from a long-term injury lay-off and will prove key in the future. Mehdi Abeid - Rising youngster that is currently playing a starring role in the reserves. Admittedly not all of the French speaking players have made a huge impact thus far this season. But the fact that a strong Francophone contingent prevails in the North East, complimented by the early season success of the Geordies is no coincidence. Without a doubt, Ba, Cabaye and Titote have been very influential. 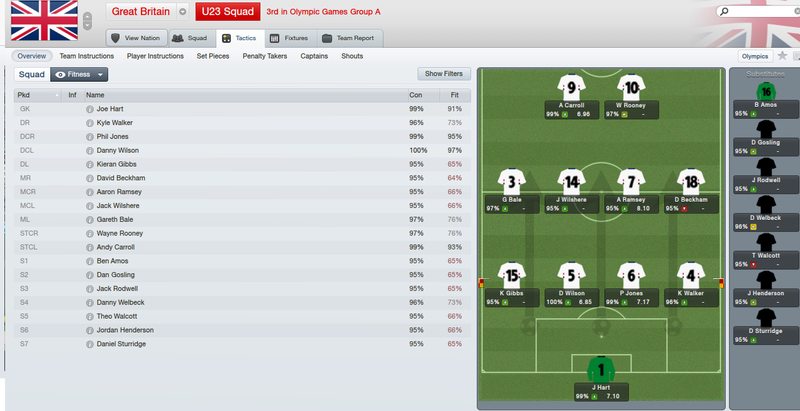 Ben Arfa has the potential to supplement the successes of the team along with Abeid and the two wingers. Ultimately it is the change in mindset and football culture that has instantaneously transformed the club from the loutish/undisciplined days of Nolan, Carroll & Barton, as is evident with Yohan Cabaye's views. The question is can the French Revolution continue? Will it inspire the non-French speakers in the team? But most importantly, will it just be a one-off for this season or provide a lasting legacy that can land Newcastle United major silverware in the not-to-distant future? For those British football fans born before the mid-late 1990s internet and mobile phone revolution, you would certainly remember the following famous TV advert. It's shot on the world famous Hackney Marshes and features the likes of Cantona, Wright, Seaman & Fowler - once highly prized footballing assets of the nascent Premier League (contemporaries of Shearer, Sheringham, Gazza et al). This was during the early era of the English Premier League boom, which eventually went global and made the English topflight the best league in the world! "People call us the noisy neighbours,"
Micah Richards, the City right-back, said. I was split between picking the obvious Van der Vaart and Robin Van Persie or the not so obvious Ryan Taylor and Micah Richards as my recommended player for gameweek 11. But after much thought I have decided to endorse Manchester City's Micah Richards. It probably doesn't make sense on having an expensive defensive unit during this season's goal glut Premier League, i.e. the likes of Baines (7.8), Vidic (7.8) and Terry (7.4) are not worth it right now. However Micah Richards is a steal (6.1) when compared to them. Whilst he hasn't scored any league goals this season he has four assists to his name - more than any defender in the Premier League. City may not have kept a clean sheet in their past four league matches, but they are bound to keep more clean sheets in the future, especially v their next opposition QPR who barely average a goal per game. Unless injured, the England international is a first teamer for Man City. He is worth having in your team, even if he turns out to be your most expensive defender. Subject to City maintaining their form and increasing their clean sheets ratio his value could smash the 6.5 mark. Buy him now! Fantasy Premier League Hints - Facebook launch! Please note that the page is currently undergoing development and is in a nascent phase. Feel free to contribute on the page and "Like" it. Wow, another fantastic goals-galore gameweek! I scored a respectable 65 points during a GW where the average score was 44. My overall rank has jumped greatly from 150,000ish to 90,000ish. But at the same time I feel like the guy who had the winning lottery numbers from the previous week! Had a I not changed my team from the last GW I would have scored 84 points! But who could have predicted the surprising scoreline at Stamford Bridge? Fortunately I still had RVP in my team and my risky pick of Dzeko as captain scored a goal to help elevate my GW score. So, who is Ba Best team in the Premier League at the moment? In my estimation it is the shoestring budget Newcastle United squad. In gameweek 10 they proved that they not only have a mean defence (the best record in the league), but they also have a lethal attack force. Demba Ba's second hat-trick of this season is a remarkable feat for a team that has no true No. 9 player in the team. At 6.5 (Ba) and 5.2 (Best), Newcastle's strike force is currently a bargain and very cheap to purchase in FPL (cheaper than Tevez combined!). Such is the superlative turnaround at Newcastle United that Alan Pardew will on current form be a shortlisted candidate for the England job after Fabio's Capello departure in 2012. As for the other gameweek 10 results, Manchester United went back to winning ways with a clean sheet victory at Everton, whilst Arsenal racked up a surprising cricket score victory at Stamford Bridge, courtesy of a Van Persie hat-trick. The Dutchman has now scored an "an outstanding 28 goals in 27 Premier League games". Man City continued their goal scoring festivities ad Blackburn were held to a controversial draw at Carrow Road. Villa drew at Sunderland, where as newly promoted Swansea's attacking prowess prevailed once again as they thumped Bolton. Fulham and Liverpool both gained clean sheet victories as Tottenham beat QPR 3-1. Unfortunately, Tottenham's concession of a goal meant that my recommended player for gameweek 10 only scored two points. But don't worry, as mentioned, have faith with him floating about in your team until mid-January. With the conclusion of gameweek 10, I have sold the Hart and Petrov, in place of Van Der Vaart and Vorm. I initially chose Hart as I felt that City would keep a good number of clean sheets. But as this season has proven, clean sheets are a premium. In fact, Vorm has kept more clean sheets than Hart and is almost half the price in value. I intend to invest in Silva and Ba at the expense of the squad rotating Dzeko and either Ramsey or Cabaye from my midfield. Whilst I would not deride Ramsey or Cabaye (they are both quality players! ), they are not as attacking as Silva, who is regularly able to breach defensive lines with his abundance of goals and assists. My team for GW 11 has now been uploaded on to the blog. I will post my recommended player for gameweek 11 shortly - hopefully within the next 24 hours or so. Until then, stay "Tooned"! - There is no point in having two domestic cup competitions (the other being the FA Cup). In recent years, even the big teams have treated the League Cup as a training/reserve team exercise. The abolition of the League Cup will ensure that there is a reduction in fixture congestion and as a result there will be less player fatigue. - By reducing the Premier League to 18 teams, the football season will finish earlier, by at least an extra 3-4 weeks. This will ensure that players get more rest and time to recover from each match. - This can be easily achieved if either of the first two proposals are implemented. The ideal time for this to occur would be in the last two weeks of December, midway through the season. This concept is not alien to football and is practised elsewhere, such as in Germany. - Time and time again we hear of complaints about English players not getting enough time to show their "talent" in an England shirt. As it stands, the limited number of friendlies creates a situation where young players would be lucky to get 10 minutes of match play in a friendly. If they fail to prove their worth, they may not get picked again. With a reduced Premier League and Winter Break, the England national football team could easily play at least two more extra friendly matches per year, in which you can have a mixed squad of players playing against mediocre and good opposition. In addition, the England B team should be revived and used as a regular platform for English players (over the age of 21) that play in the Premier League, but are on the fringes of the England national team. - This may seem pretty obvious, but it is often neglected, especially in England. The FA had a "School of Excellence" from 1984-1999, which produced the likes of Michael Owen and Joe Cole (and many other Premier League players). However, no decent alternative exists today. Without something similar and better, the England football team will not progress any time soon. - It would be wrong to put a cap on the number of EU and non-EU players that play in the Premier League. However, it is about time that the FA did do more to nurture domestic talent in the top flight. One way that they could do this would be to introduce a rule that demands the inclusion of at least 5 English players in a match squad. To put this in perspective, that would be 5 players from a first team squad of 16-20. It will ensure that English players get a chance, whilst not undermining the positive presence of foreign players. - It is unbelievable to think that a considerable number of English players earn over £100,000 a week, yet fail to deliver on the international stage. The Premier League has the highest average weekly wage per player in the world. Paying high amounts to such players only adds to their egos and prima donna statuses. Consequently, as a common sense and cost effective measure, it would be best to introduce a salary cap (excluding performance related bonuses) that is reviewed every season. - Time and time again we see young foreign players leaving their home countries to seek opportunities abroad. Such a hunger is currently not present within England. In fact, it is rare for an English player to ply their trade abroad. Of course, there are rare exceptions that do, such as Owen Hargreaves who started at Bayern Munich as a youth player and then became a full England international. France (and the continent) is only a train ride away for many would-be English professionals that want to develop their game. Instead of complaining about the lack of opportunities abroad, they should be incentivised to go abroad to develop their game, rather than slumping into semi-professional/amateur oblivion. - This is a controversial idea, but the fact of the matter is that almost all English players are contracted to Premier League clubs. It would make more sense for the governing body of the Premier League to take charge of the England team than the FA. The FA should concentrate on the administration of the Football League (Championship to League One), as well as the development of grass-roots football. The Premier League may be money-driven, but it is also results driven, unlike the FA. Therefore a radical shake up in the overseeing of the England team could lead to better success on and off the pitch. My team for gameweek 2 during the 2010/2011 season. 60 points scored, with 12 points lost on the bench. Last year if you made more than one transfer per gameweek, points would be automatically deducted from your head-to-head tallies, but not from your overall leagues or classic league points. This year, you will now also lose points from your overall leagues and classic league tallies. It means that you need to be wiser with your transfer spending as you will lose out on an overall ranking basis with bad team selections. Read my Management Advice page for more information. A wildcard allows you to change your entire selected team for any gameweek without having any points deducted from your overall, classic and head-to-head league tallies. Last year the FPL game issued each team with two wild cards - to be used at any time. This year there are two wild cards, of which only one can be used between gameweeks 20 and gameweeks 23 with the other any time before or after. My advice would be to avoid using your wildcard unless you absolutely have to, i.e. perennial bad injuries, long-term suspensions or poor form for a significant number of your team's players. If you are going to use it voluntarily, try doing so after the January transfer window and/or near the end of the season, in case teams have bought new signings and they do well later on. This is the time for a Stoke purchase to capitalize on their favorable fixture list. Having only conceded one goal at home they play Newcastle, QPR, and Blackburn at home in the next four Gameweeks with Bolton away in between. Begovic and Shawcross are the reliable picks but for only 4.0 you could pick up right back Andy Wilkinson. Should you want to gamble on Stoke delivering goals Walters and Etherington stand out as the attractive picks. Walters is playing up front and has penalty duties, having registered two goals, two assists, and seven bonus points this season. Etherington has a proven Fantasy track record, having scored ten goals and provided 16 assists in the last two seasons.